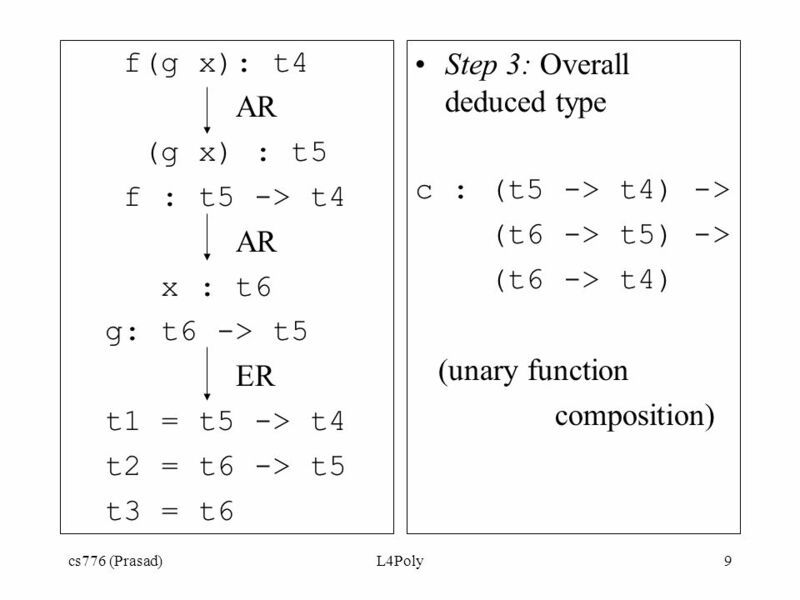 Cs776 (Prasad)L4Poly1 Polymorphic Type System. 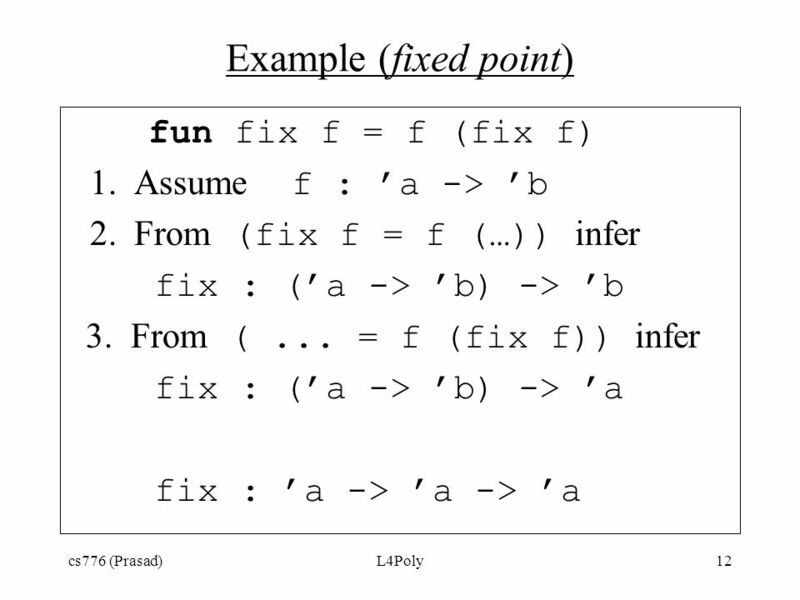 cs776 (Prasad)L4Poly2 Goals Allow expression of “for all types T” fun I x = x I : ’a -> ’a Allow expression. 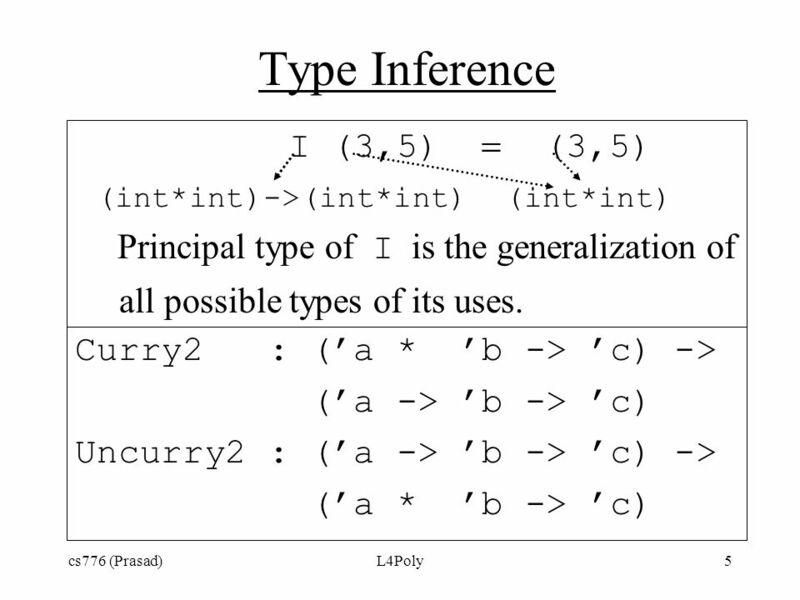 3 cs776 (Prasad)L4Poly3 Polymorphic Type System Type constants int, bool, … Type variables ’a, …, ’’a, … Type constructors  ->, *, … Principal type of an expression is the most general type, which ML system infers. Type Checking Rule An expression of a type can legally appear in all contexts where an instance of that type can appear. 4 cs776 (Prasad)L4Poly4 Signature of Equality = : ’a * ’a -> bool ? Equality (“= ”) is not computable for all types. E.g., function values. 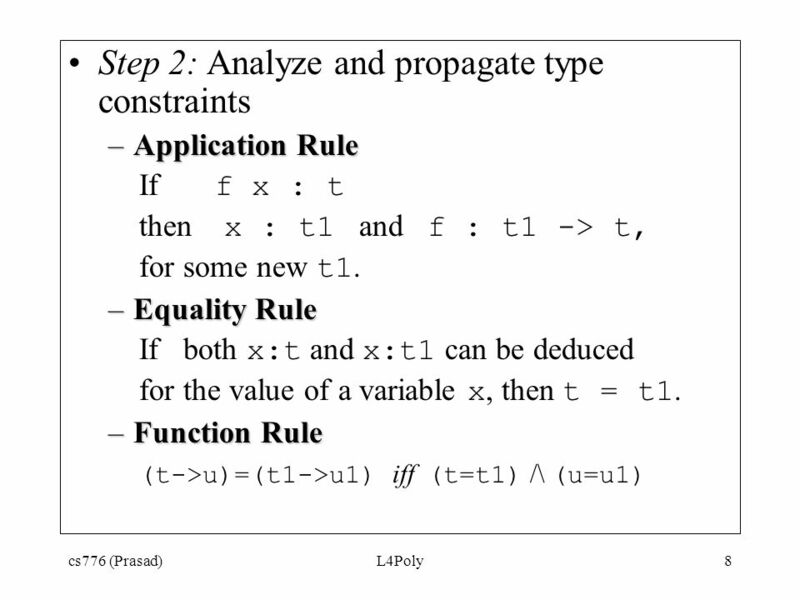 So types (’a,’b, …) are partitioned into types that support equality (’’a, ’’b, …) types that do not support equality. 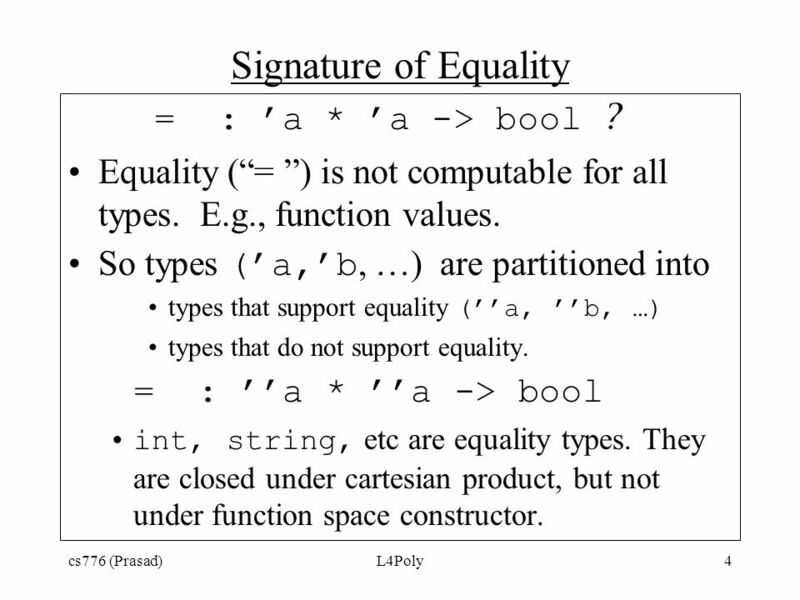 = : ’’a * ’’a -> bool int, string, etc are equality types. They are closed under cartesian product, but not under function space constructor. 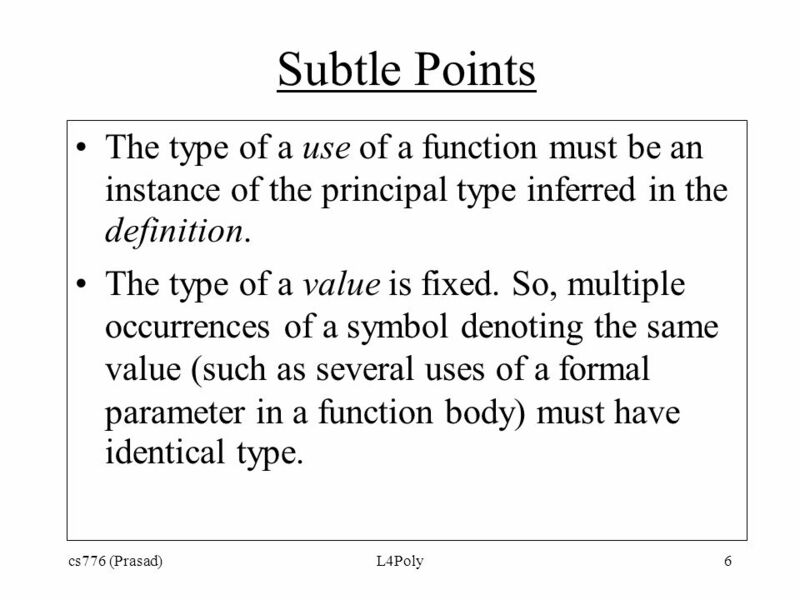 6 cs776 (Prasad)L4Poly6 Subtle Points The type of a use of a function must be an instance of the principal type inferred in the definition. The type of a value is fixed. So, multiple occurrences of a symbol denoting the same value (such as several uses of a formal parameter in a function body) must have identical type. 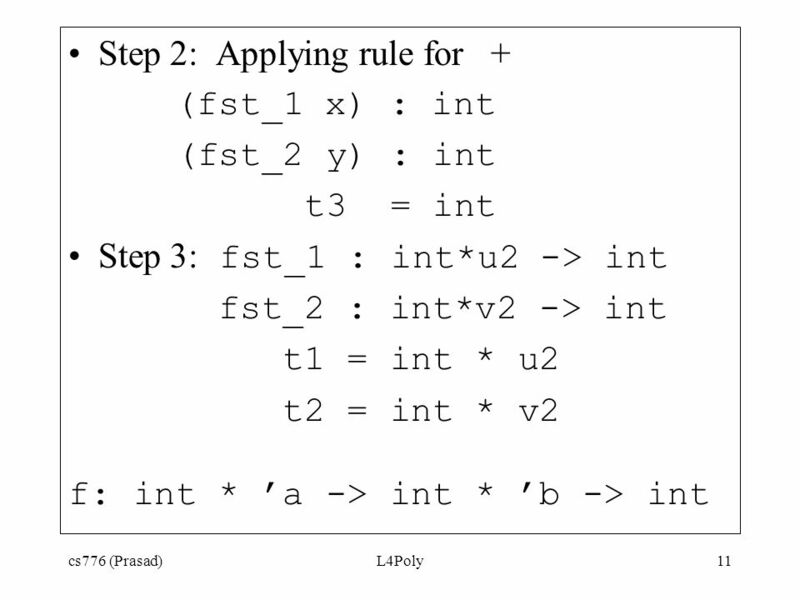 16 cs776 (Prasad)L4Poly16 (cont’d) fn (x,y) => (size x, length y); val it = fn : string * 'a list -> int * int fn z => (size z, length z); Type Error string and list cannot be unified to obtain ’a -> (int * int). 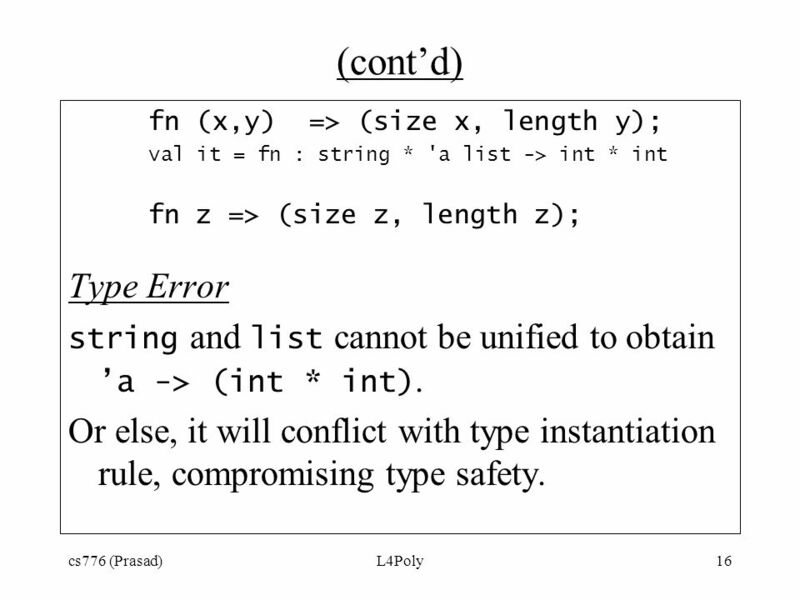 Or else, it will conflict with type instantiation rule, compromising type safety. 17 cs776 (Prasad)L4Poly17 Equivalence? 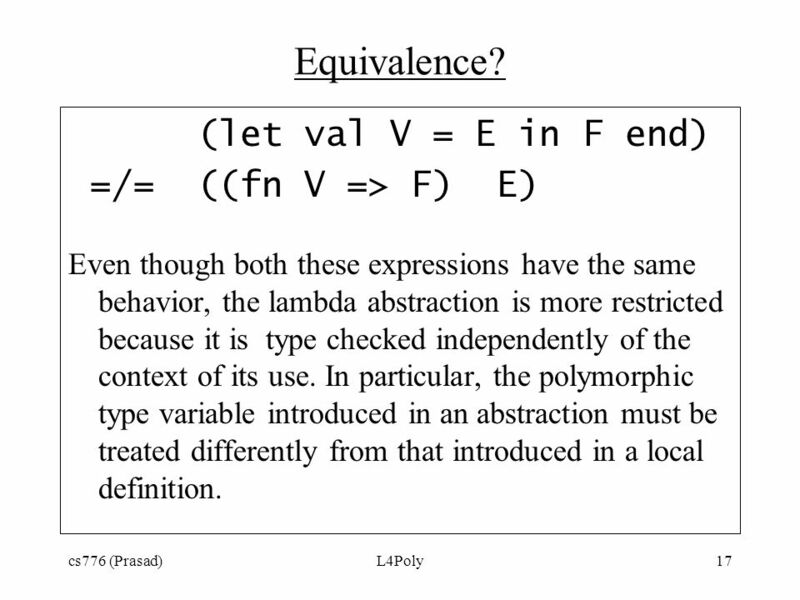 (let val V = E in F end) =/= ((fn V => F) E) Even though both these expressions have the same behavior, the lambda abstraction is more restricted because it is type checked independently of the context of its use. 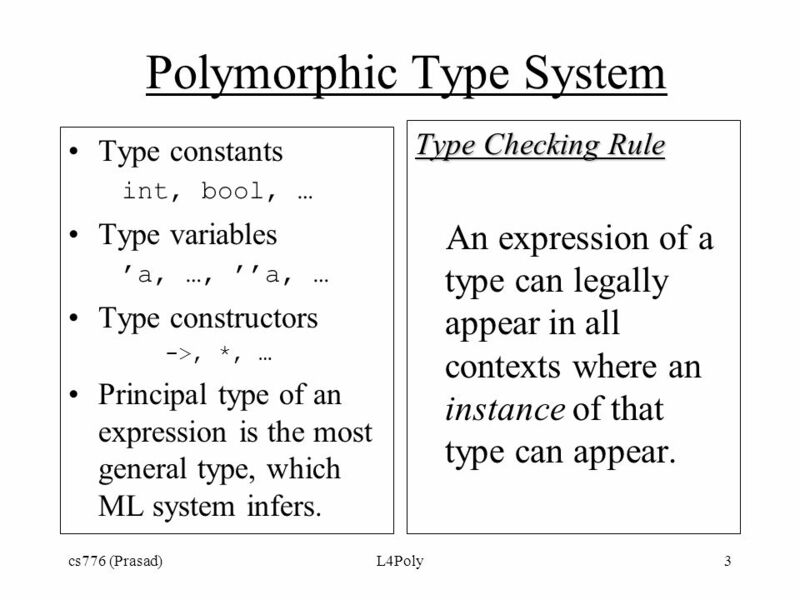 In particular, the polymorphic type variable introduced in an abstraction must be treated differently from that introduced in a local definition. 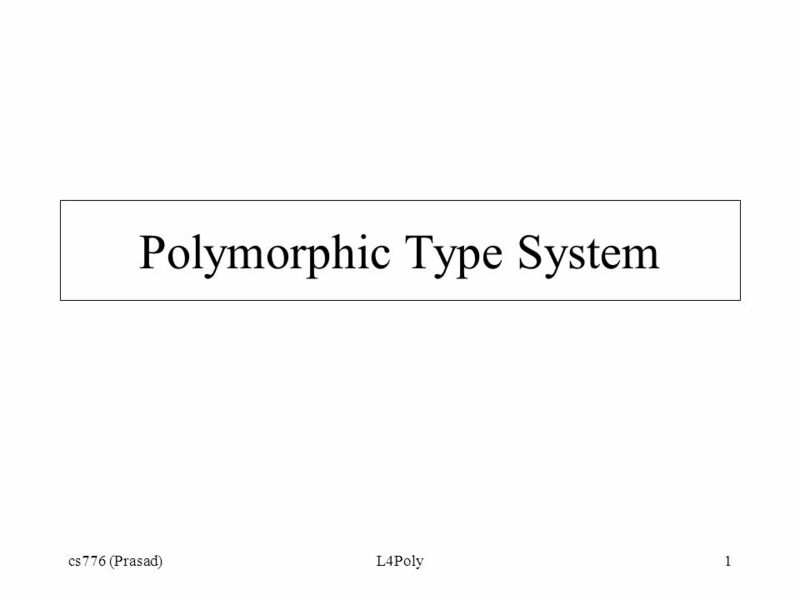 Download ppt "Cs776 (Prasad)L4Poly1 Polymorphic Type System. 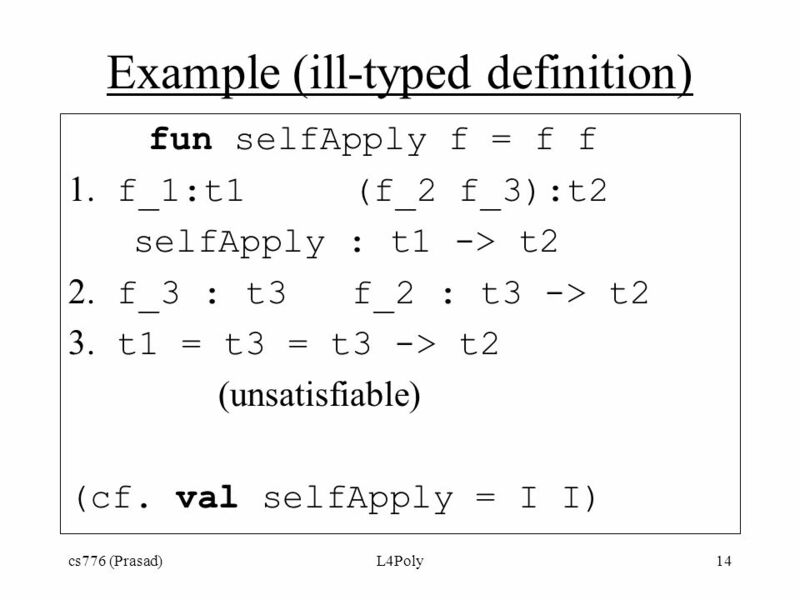 cs776 (Prasad)L4Poly2 Goals Allow expression of “for all types T” fun I x = x I : ’a -> ’a Allow expression." 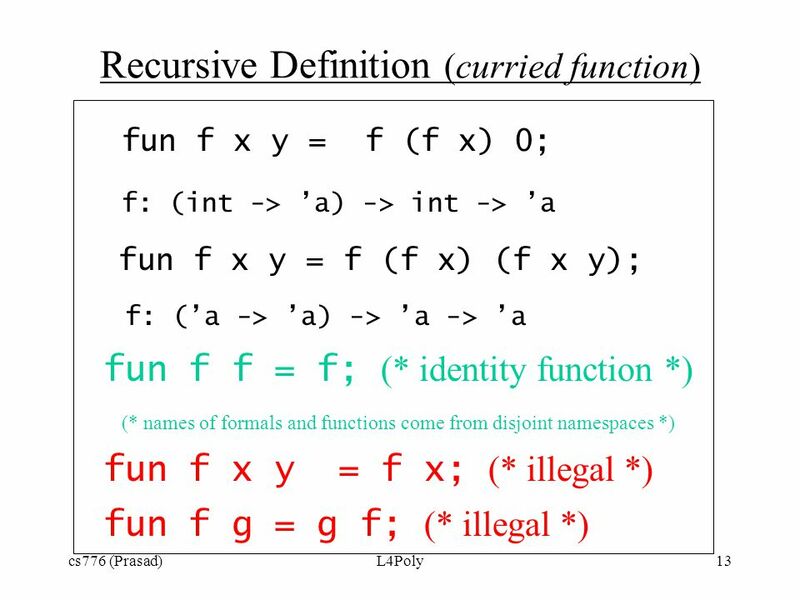 Functional Programming Lecture 10 - type checking. ML Lists.1 Standard ML Lists. ML Lists.2 Lists  A list is a finite sequence of elements. [3,5,9] ["a", "list" ]   Elements may appear more than once. 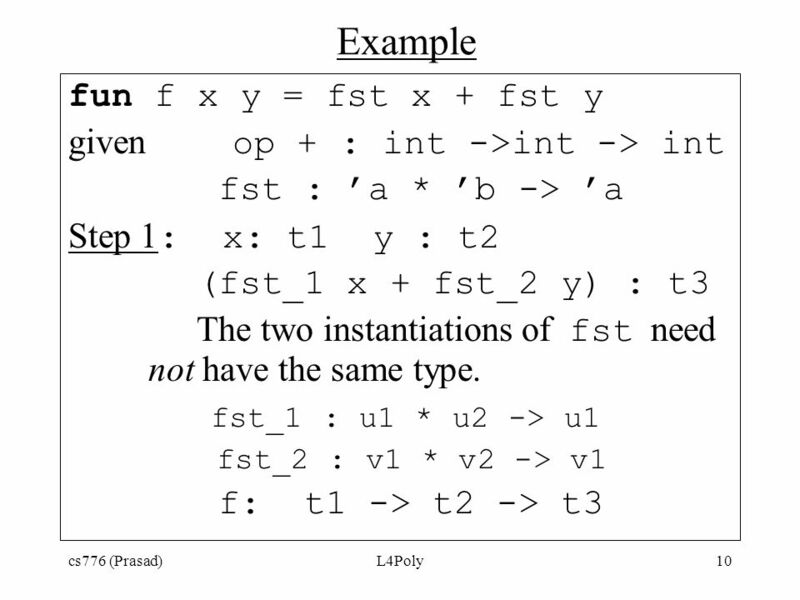 Kathleen Fisher cs242 Reading: “Concepts in Programming Languages”, Chapter 6. A Third Look At ML 1. Outline More pattern matching Function values and anonymous functions Higher-order functions and currying Predefined higher-order. Type Variables in ML Until we know the type of a value (perhaps never! 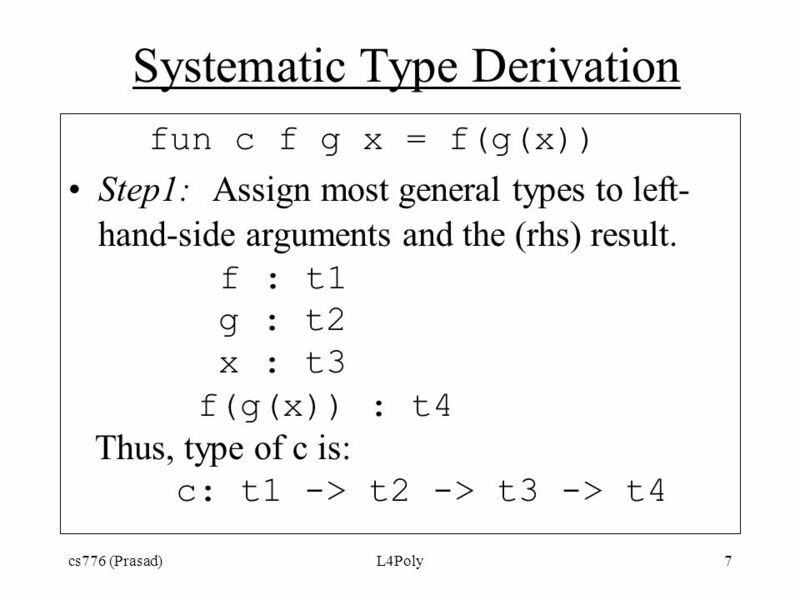 ), we use a variable for its type Book uses, e.g., t1, tx, tf PL literature uses. ML Exceptions.1 Standard ML Exceptions. ML Exceptions.2 Exceptions – The Need  An extensive part of the code is error handling  A function can return. 10 October 2006 Foundations of Logic and Constraint Programming 1 Unification ­An overview Need for Unification Ranked alfabeths and terms. Substitutions. ML Lists.1 Standard ML Lists. ML Lists.2 Lists  A list is a finite sequence of elements. [3,5,9] ["a", "list" ]   ML lists are immutable.  Elements. 1 Mooly Sagiv and Greta Yorsh School of Computer Science Tel-Aviv University Modern Compiler Design. CS7100 (Prasad)L16-7AG1 Attribute Grammars Attribute Grammar is a Framework for specifying semantics and enables Modular specification. Recap 1.Programmer enters expression 2.ML checks if expression is “well-typed” Using a precise set of rules, ML tries to find a unique type for the expression. Denotational Semantics Syntax-directed approach, generalization of attribute grammars: –Define context-free abstract syntax –Specify syntactic categories. Parametric Polymorphism COS 441 Princeton University Fall 2004. 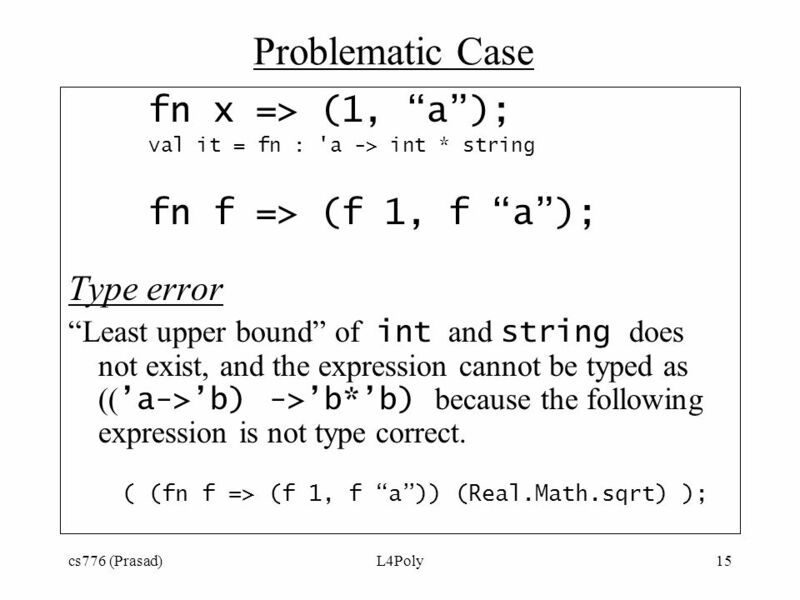 CSE341: Programming Languages Lecture 11 Type Inference Dan Grossman Winter 2013.